Jeronimos Monastery - Greatness and Excellence! As you probably know, the Jeronimos Monastery is classified as a World Heritage Site by the UNESCO since 1984. 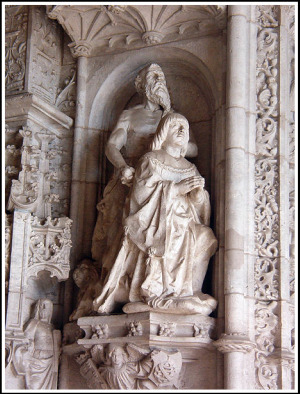 "Standing at the entrance to Lisbon harbour, the Monastery of the Hieronymites – construction of which began in 1502 – exemplifies Portuguese art at its best." Although the UNESCO says the construction began in 1502, the official site of the monument claims that it started one year earlier. Hummm.... Which one is right? I sincerely don't know, but I suspect it doesn't matter that much, right? More curious is that it took almost a century to finish this great monument. In 1496, the King Manuel I asked permission to the Holly See to build the Monastery. 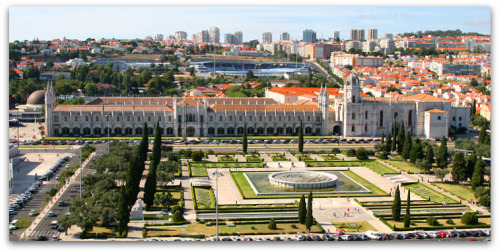 It was built to replace the Church of Santa Maria de Belém. It was, of course, dedicated to the same Santa Maria de Belém, as a thanksgiving for the success of the journey to India. It became the House of the Monks of Saint Jerome (that gave the name to the Monastery). This is because of their spiritual work guiding the portuguese sailors and praying for the king's soul. The history says that Vasco da Gama and his men spent the night before leaving to India (a remarkable dangerous journey) praying in an old Eremite (Ermida do Restelo) that existed in that same place. The construction began shortly after the arrival of Vasco da Gama from his trip to India and it was financed with the money generated by the eastern spices. Who can we find there? It served as the first National Pantheon. Besides the King and his descendents you can find there some famous portuguese people. For example, Vasco da Gama, who was the commander of the first ships to sail directly from Europe to India. 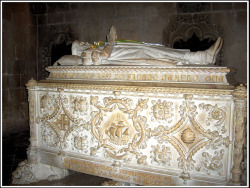 Also, Luís de Camões, poet and writer of Os Lusíadas that exalt and glory the achievements of Vasco da Gama and his men. Almeida Garret, Alexandre Herculano and Fernando Pessoa, famous portuguese writers. And Teófilo Braga and Óscar Carmona, Presidents of the Republic of Portugal. In 1833 the religious orders were expulsed from Portugal (unfortunately, this was a very sad time in our history) and the Monastery became property of the state and served as a college until 1940. During the restoration 1850, it was added to the Monastery the National Archaeological Museum. In the west wing you can also find the Maritime Museum. It was in this magnificent monument that the Lisbon Treaty was signed in 2007, laying down the basis for the reform of the European Union. 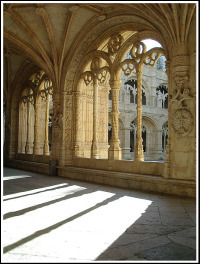 I invite you to appreciate the outstanding cloisters of the Jerónimos Monastery with magnificent columns, each one decorated with maritime motifs like sea monsters and coils of rope. Great monument of the Age of the Discoveries, the Jerónimos Monastery is a powerful symbol of the Portuguese power and richness in those days. Jerónimos Monastery is one of the best pieces of the Manueline architectural style (characterized by maritime motifs and extremely elaborated sculptural details). It's a must see by every tourist that come to Lisbon.